PayPal was late to the party, only banning Infowars and its affiliated Prison Planet website on September 21st over Jones’ long history of harassment and hate speech—weeks after Apple got it started by removing many of his podcasts in August. While removing Jones from Apple and other platforms like Facebook, YouTube, and Twitter primarily impacted his reach, the PayPal ban directly affects core revenue streams like his dubious supplement business. As the New York Times noted, at the time Jones was granted a 10-day grace period to continue using PayPal, but after that it’s unclear how he can continue processing transactions on his website. Other payment processors like Square have similar policies against hate speech, so he may be relegated to selling through his Amazon store or eBay, the paper wrote. “It is at this point well known that large tech companies, located primarily in Silicon Valley, are discriminating against politically conservative entities and individuals, including banning them from social media platforms such as Twitter, based solely on their political and ideological viewpoints,” Jones’ company, Free Speech Systems, states in a 15-page complaint. 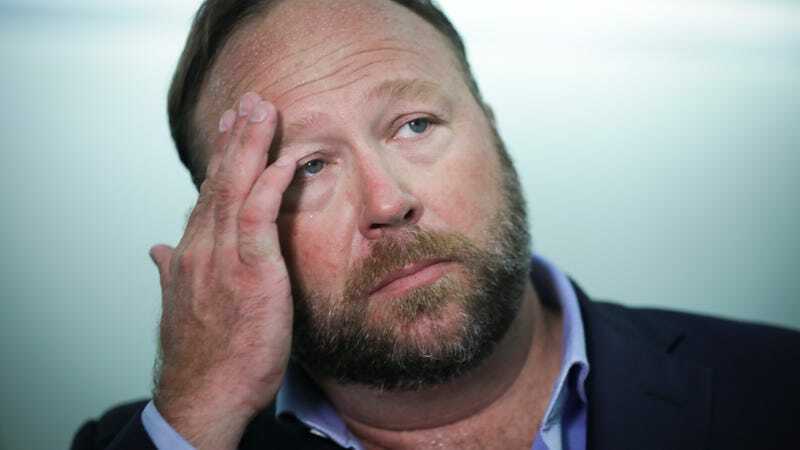 ... Jones claims PayPal’s decision was based purely on “viewpoint discrimination.” He also says the decision was made based on conduct that “had nothing to do with” the PayPal platform, which purportedly violates Infowars’ contract with the payment-processing giant. Were PayPal’s decision allowed to stand, it would set “a dangerous precedent for any person or entity with controversial views,” Jones’ company claims in its lawsuit. In his 15-page complaint, Jones also argued that PayPal policies prohibiting “the promotion of hate, violence, racial or other forms of intolerance that is discriminatory” are “purposely vague, and could conceivably (and unconscionably) be applied to any speech at all, given the opaque manner in which PayPal has applied them.” Of course, Jones agreed to those terms when he signed up for PayPal, and the Times noted a PayPal spokesperson said the company had determined Jones’ violations reached beyond any singular rule. PayPal booted a number of accounts belonging to members of racist, far-right groups last year without any apparent legal repercussions. A somewhat similar lawsuit by white supremacist Jared Taylor against Twitter claiming that his ban from that platform constituted discrimination (and represented by Marc Rendazza, the same attorney representing Jones in this case) was thrown out by a California state appeals court. Jones’ current legal battles are far from limited to the PayPal case. He is facing down multiple ongoing defamation lawsuits brought by families of mass shooting victims and others he has accused of being nefarious deep state operatives, putting him under yet more financial pressure.